August 14, 1933 – Joseph Hastings, a Chicago policeman married for only four months, is shot to death during a gun battle with two thieves who rob a city office on Navy Pier. He is the eleventh policeman to die in the line of duty during 1933. The stolen money was intended for men on emergency relief who were employed by the city to do work at the pier. Thomas B. Rawls, an official of the West Englewood Currency exchange, used it to cash checks from the workers at a fee of 15 cents a check. It is unclear why a representative of a private enterprise is cashing checks in an office of the city street department. Hastings, hearing a shot fired, runs into a second floor office at the west end of the pier. One of the dozen clerks in the office, Charles Eddy, outlines the ensuing events, “Hastings came in the door with his revolver drawn . . . The man at the side wall opened fire. The policeman fell to the floor and fired two shots in return. The robbers ran to the door. Hastings got up, and one of the robbers turned and shot him as he rose. The robber then grabbed Hastings’ gun and ran out. . .” [Chicago Daily Tribune, August 13, 1933] Morris Cohen a barber, is captured 30 minutes later at 1331 North Clark Street. His two companions remain on the lam. 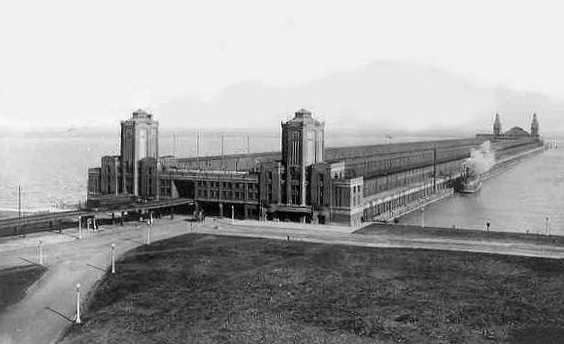 The above photo depicts Navy Pier as it appeared in 1933.